Perspective of Church Building Plan published on CRLC Newsletter. According to the Lutheran doctrine, there are two definitions of a church. The first definition refers to the church as the people who believe in God and were saved by faith in Jesus Christ as their Savior. The second definition refers to the church as a place of worship or the church building. And who would not want a church building that will give glory to God, a church building that is built to house its lambs and all its material belongings? Twenty years ago, the Chi Rho Lutheran Church started aiming to have its own church building. 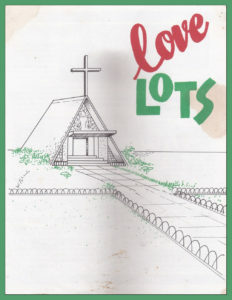 “Love Lots” as they called their project, the congregation dreamed of a church building with a clear vision. A Worship Service in the old church building during the 80’s. History tells us that the Chi Rho Lutheran Church started as a mission outstation in 1974. 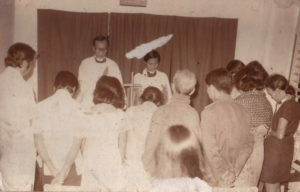 It officially became a congregation in 1975 with their worship services held at Doña Rosario, Novaliches, Quezon City. As time passed, they were able to acquire their own lot at Interville III Subd., Novaliches, Quezon City. They constructed their church building using coco lumber with tolda as their roof. But the church did not stop there. Little by little, they were able to use stronger materials and even built their own parsonage, caretaker’s house and canteen. The wrath of Typhoon Ketsana “Ondoy” in 2009. 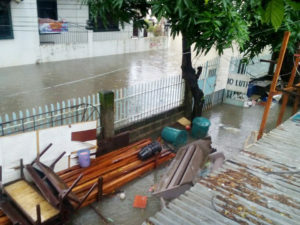 CRLC gets flooded not just during typhoons but also with heavy rains. But sometimes heavy floods hit the area. With the onslaught of Typhoon Ketsana “Ondoy” in 2009, the church building was flooded with waters more than two meters high. There were times that flood waters rise even if there are no storms. A lot of church properties were damaged including those that belonged to the church caretaker. With the goal of becoming in the position to rescue its neighbors in times of flooding or storm, the congregation was determined to pursue its building project. Men and youth at work in the ongoing Church building construction. Since the worst flood they encountered was two meters deep, the building was designed on a three meter elevation. The congregation prayed earnestly that the project will be done according to God’s will. They hoped that eventually the burden of having to endure occasional disasters will be eased. Although financially incapable, the congregation still decided to go on with the project. Construction went on and off. There were discouragements but faith is faith, they did not stop. And the Lord is always able. A lot of financial help came from the congregation itself and from the brothers and sisters in Christ who were used by God. The men and the youth helped in the construction. Members saved money through piggy banks to be offered for the church building fund. Some even offered their birthday budget. The church borrowed from another Lutheran congregation and was not rejected. The congregation was blessed when the Elenzano family in Seattle, USA managed to have a fund raising concert in their church. A one night concert filled with the Holy Spirit at St. Mark’s Lutheran Church brought help even though they do not know Chi Rho Lutheran Church personally. A work of God indeed. 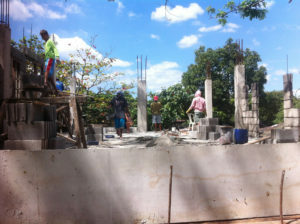 The church building project is still going on. The congregation believes that through God’s wisdom, guidance and provision, the building will be fully furnished this year. Indeed, the church is filled with thankfulness and is rejoicing for truly God in Christ does wonders and miracles when we do His will for He is King over the floods. To God be all the glory. The unfinished church building construction but already being used during their Worship Services and activities.